The news today was of a fall in unemployment. 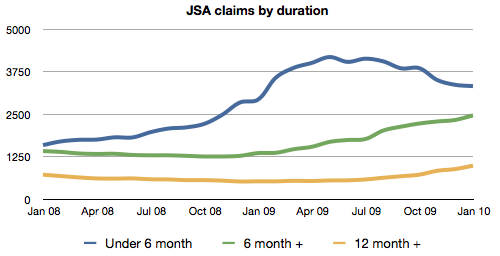 Paradoxically, underlying this is an increase in JSA claimants. I’ve often said that JSA claims and unemployment are not the same thing, since many choose not to claim Jobseekers Allowance for a variety of reasons; they might be able to live off their own means or just be too proud. And some have that choice made for them because they are not eligible. In Wandsworth 6,789 people (a claim rate of 3.3%) were claiming JSA in January, this is 195 (3% higher) than the previous month and 1,966 (40.8% higher) than the same time last year. This wipes out all the falls since October and is only 25 off being the highest figure since the recession began. One unfortunate outcome of the recession is the rise in longer term unemployment. This is a lagging indicator, since, obviously, you can’t immediately be long term unemployed, but you can start to see the curves moving upwards in the 6 month and 12 month plus lines. Depressingly those six and twelve month lines are likely to continue moving upwards and even now they make up just over half of all the claims (3,460 over six month compared to 3,329 under six months).